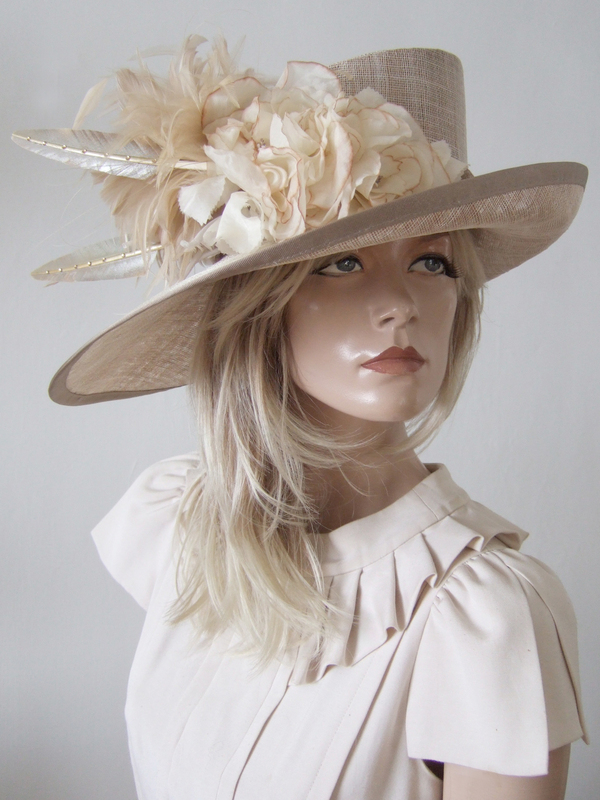 Stunning Angled Brimmed Hat with mushroom toned crown, and light gold brim edged in mushroom petersham. With a short upturned brim on the left side, and long sloped on the right. Decorated on the right side, with the crown wrapped in a nutmeg coloured sinamay. Large plume of natural coloured hackle, cream tan dipped silk flowers, and two American Eagle arrow feathers in vintage gold with Light Colorado Topaz Swarovski Crystals. Works well with Neutrals, Browns, Cream, or Gold. Crown has a 22.75" inside circumference. Brim is 6.25" wide on the downsweep. Brim 3" Wide at the upsweep.